Liebherr UWKes 1752 at the LOWEST PRICE in UK! 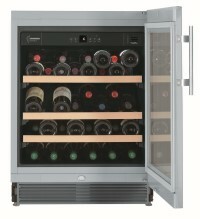 The Liebherr UWKes 1752 GrandCru integrated wine cabinet guaranteed to be the best price from Cavepromotor in the UK. The Liebherr UWKes 1752 GrandCru is a modern, state of the art, luxury integrated wine cabinet in a stainless steel frame, silver painted side walls and an insulated glass door. The Liebherr UWKes 1752 has a storage capacity for 46 bottles (Bordeaux size). The Liebherr UWKes 1752 has a user friendly control panel to control the temperature zone. Besides the temperature, the Liebherr UWKes 1752 GrandCru controls the humidity and ensures optimum air quality. To receive the best price for a Liebherr UWKes 1752 GrandCru please click on the Request Quotation or alternativley you can call directly on 020 3318 46 91. Comparing online prices you will find out that Cavepromotor has the best prices in The UK. The Cavepromotor origins are in the wine industry, therefore we are continuously concerned about the perfect storage and serving of your wines. To control the level of humidity, Cavepromotor includes a digital hygrometer and FreshAir Carbon filter alert service. So while comparing be aware that you compare 'apples to apples'. In addition, and as part of our service strategy, our wine Specialists are available with advise and best practice information, before and after your wine cabinet purchase. Liebherr wine cabinets & fridges are the only manufacturer Cavepromotor sell and because of this we can purchase the Liebherr UWKes 1752 Vinidor for the very best price.